Both Trace and Log are built on top of a mechanism named shared buffer (Sbuf). sbuf can serve as a conventional ring buffer in hypervisor in over-written mode. A lock is required to synchronize access by the producer and consumer. Both ACRNTrace and ACRNLog use sbuf as a lockless ring buffer. The Sbuf is allocated by SOS and assigned to HV via a hypercall. To hold pointers to sbuf passed down via hypercall, an array sbuf[ACRN_SBUF_ID_MAX] is defined in per_cpu region of HV, with predefined sbuf id to identify the usage, such as ACRNTrace, ACRNLog, etc. For each physical CPU there is a dedicated Sbuf. Only a single producer is allowed to put data into that Sbuf in HV, and a single consumer is allowed to get data from Sbuf in SOS. Therefore, no lock is required to synchronize access by the producer and consumer. 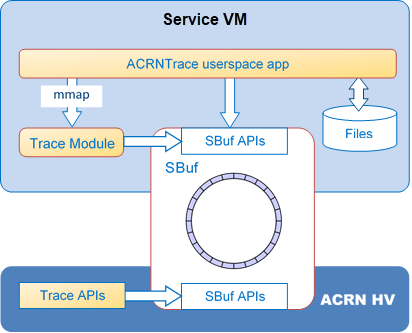 ACRNTrace is a tool running on the Service OS (SOS) to capture trace data. It allows developers to add performance profiling trace points at key locations to get a picture of what is going on inside the hypervisor. Scripts to analyze the collected trace data are also provided. Trace APIs: provide APIs to generate trace event and insert to Sbuf. reference APIs defined in hypervisor/include/debug/trace.h for trace_entry struct and functions. provide mmap operation to map entire Sbuf to userspace for high flexible and efficient access. On SOS shutdown, the trace module is responsible to remove misc devices, free SBufs, and set per_cpu sbuf[ACRN_TRACE] to null. ACRNTrace application includes a binary to retrieve trace data from Sbuf, and Python scripts to convert trace data from raw format into readable text, and do analysis. Figure 2.2 shows the sequence of trace initialization and trace data collection. With a debug build, trace components are initialized at boot time. After initialization, HV writes trace event date into sbuf until sbuf is full, which can happen easily if the ACRNTrace app is not consuming trace data from Sbuf on SOS user space. Once ACRNTrace is launched, for each physical CPU a consumer thread is created to periodically read RAW trace data from sbuf and write to a file. acrnalyze.py analyzes trace data (as output by acrntrace) based on given analyzer filters, such as vm_exit or irq, and generates a report. See acrntrace for details and usage. Logs remaining in the buffer, from last crashed running. 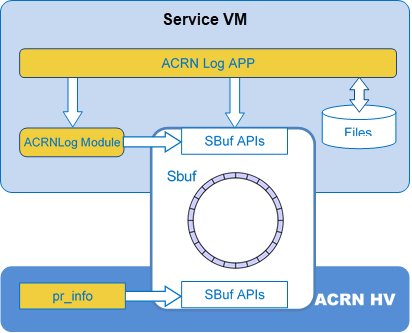 ACRN log support in HV: put logs at specified loglevel to Sbuf. There are 6 different loglevels, as shown below. The specified severity loglevel is stored in mem_loglevel, initialized by CONFIG_MEM_LOGLEVEL_DEFAULT. The loglevel can be set to a new value at runtime via hypervisor shell command “loglevel”. The element size of sbuf for logs is fixed at 80 bytes, and the max size of a single log message is 320 bytes. Log messages with a length between 80 and 320 bytes will be separated into multiple sbuf elements. Log messages with length larger then 320 will be truncated. For security, SOS allocates sbuf in its memory range and assigns it to the hypervisor. To handle log messages before SOS boots, sbuf for each physical cpu will be allocated in acrn hypervisor memory range for any early log entries. Once sbuf in the SOS memory range is allocated and assigned to hypervisor via hypercall, the Hypervisor logmsg will switch to use SOS allocated sbuf, early logs will be copied, and early sbuf in hypervisor memory range will be freed. the misc devices implement read() file operation to allow userspace app to read one Sbuf element. When checking the validity of sbuf for last logs examination, it sets the current sbuf with magic number 0x5aa57aa71aa13aa3, and changes the magic number of last sbuf to 0x5aa57aa71aa13aa2, to distinguish which is the current/last. On SOS shutdown, the module is responsible to remove misc devices, free SBufs, and set per_cpu sbuf[ACRN_TRACE] to null. ACRNLog application reads log messages from sbuf for each physical CPU and combines them into log files with log messages in ascending order by the global sequence number. If the sequence number is not continuous, a warning of “incontinuous logs” will be inserted. To avoid using up storage space, the size of a single log file and the total number of log files are both limited. By default, log file size limitation is 1MB and file number limitation is 4. If there are last log devices, ACRN log will read out the log messages, combine them, and save them into last log files. See acrnlog for usage details.